The world’s shark population is experiencing significant decline with perhaps 100 million or more sharks being lost every year, according to a study published this week in Marine Policy. While sharks are one of the oldest vertebrate groups on the planet, the population decline is causing global concern. 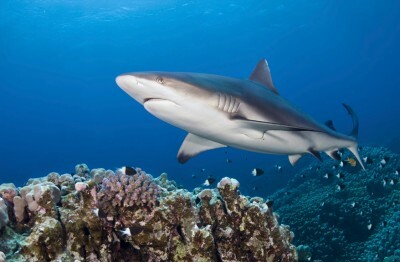 In the recently published paper, “Global Catches, Exploitation Rates and Rebuilding Options for Sharks,” researchers from Dalhousie University and University of Windsor in Canada, as well as Stony Brook University in New York, FIU and the University of Miami calculate total shark mortality and outline possible solutions to protect the world’s shark population. Such changes can harm other species, and may negatively affect commercial fisheries, according to Heithaus, who also serves as a Marine Sciences professor in the Department of Biological Sciences. Based on data collected for the latest study, shark deaths were estimated at 100 million in 2000 and 97 million in 2010. The total possible range of mortality is between 63 and 273 million annually. The biggest culprit in the significant population decline is a combination of a global boom in shark fishing — usually for their valuable fins — and the relatively slow growth and reproductive rates of sharks. Because adequate data of shark catches is lacking for most of the world, the wide range of possible mortality is based on available data of shark deaths and calculated projections for unreported, discarded and illegal catches. But even with the uncertainty there is little question that sharks are being caught faster than they can reproduce. While some sharks are receiving protection through national and international agreements, the team of researchers suggests legislation should be expanded to a greater number of species. Imposing a tax on the export and import of shark fins could also help curb demand and generate income for domestic shark fisheries management, according to the study. Catch limits, trade regulations and other protective measures for the most vulnerable species can also help. The key message in this research is sustainability. Because of the role sharks play in the sustainability of marine ecosystems, the researchers insist that protective measures must be scaled up significantly to avoid further depletion and possible extinction of some of the world’s top predators. The information from this report comes at a critical time, as 177 governments from around the world will attend the March 3-14 meeting of the Conference of the Parties to the Convention on International Trade in Endangered Species of Wild Fauna and Flora (CITES) in Bangkok. CITES is widely considered one of the best tools for protecting vulnerable species from extinction. So if somebody gets hurt or killed by an occasional shark we have no room to complain. Considering how you’re more likely to drown in the water, struck by lightning AT the beach, or killed by a more acceptable species (bees come to mind) than being attacked, let alone killed, by a shark… pretty much. Assuming this isn’t obvious trolling, I thought we got past “sharks are killer monsters” which was invented by Hollywood. I hope you aren’t referring to my comment. Did you read it? I’m saying that humans have no right to complain about sharks attacking humans since humans kill so many of them. Oh boy, i guess we have the classic “sarcasm doesn’t translate well on text” scenario. In this case, I misread your post as sarcasm when it was actually literal. The “we have no room to complain” is what mostly threw me off. Unfortunately, the way we “fish” now kills many other species, not just the sharks. Too bad that we can’t just take what we need. We want it ALL!.. We’ll see where will this lead..